Have you ever felt like the worst parent in the world? If so, you’re not alone. 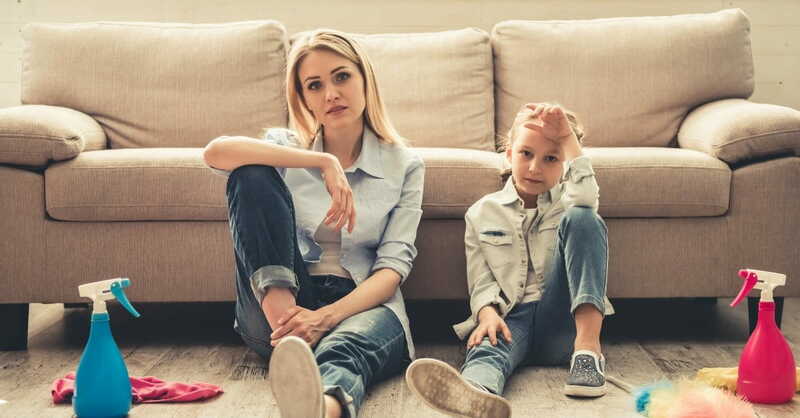 I still recall the time at my son’s elementary school when frayed nerves and pseudo-single parenting—the term I coined for flying solo while my husband was deployed—catapulted me straight to what I felt certain was my last nerve. I quipped answers at the kids, clenched teeth, and attempted to keep control over two active, young children while also soothing a crying youngster bent on bolting from his prison on wheels. (You and I would call that “prison” a stroller.) It proved exhausting. In the classroom that day, another mom noticed my turmoil. She stepped to my ear and whispered, “It’ll be alright, mama.” She meant well, and I’m thankful for her concern, but I walked out of that school feeling like the worst parent in the world. The voice of condemnation (quite different from God’s conviction) filled my mind with many thoughts. After all, don’t good parents have patience--always? Aren’t their kids well-behaved at all times? And goodness, don’t their littles sit quietly in strollers consistently without raising a ruckus? That thinking fails to include fallible humans and a grace-filled Savior. None of us are perfect, only Jesus is. But when we believe our shortcomings and messy situations label us as parenting failures, condemnation, often based on fear, infiltrates our minds. Lean in close and listen to the internal chatter. Does fear chime, “not good enough,” “you’ll damage your kids,” “I just can’t do it,” or some other bit of banter? If so, there’s good news. Perfect love casts out all fear. Forget being the worst parent in the world. Turn a deaf ear toward fear. God turns mistakes and weaknesses into beautiful stories of His glory with a four-letter word: love. We may struggle in our parenting skills, but we have a Father who leads us daily with love. And with Him, all things are possible. (Matthew 19:26) Our involvement includes simply offering ourselves to Him through prayer, forgiveness, with humility, and a need for wisdom. God hears our cry for help. My kids are now teenagers and I’ve settled into a “mama sweet spot” of sorts, but as I look back at those earlier years, I see several glimpses of my Father among the tumultuous times. I wasn’t the world’s worst parent after all—and neither are you. If condemnation hinders your parenting, lean on the Lord and stand on His truth. Below are a few Scriptures and action steps to help us as we traverse parenting’s rocky territory—from raising wee ones to adults. Feelings often call us into immediate action, send us down anger’s pothole-filled path, or thrust us straight into a dark, ugly vat of discouragement. They label us as acceptable or unacceptable, victor or failure. But feelings are like a yo-yo. One minute we’re up, the next we’re down. More faithful and steadfast than feelings is trust placed in the Lord Almighty. He loves, forgives, waits patiently, and parents well. Nowhere in the Bible does He wag a finger at us and utter the words, “You are the worst parent in the world.” Instead, He leads us faithfully. Why not trust God versus the yo-yo effect of feelings? Action Step: The next time you feel like a bad parent, weigh your feelings against the Bible. If you’re not already on a Bible reading plan, consider one to become familiar with God’s word. How many times do we slap labels on ourselves? “Worst parent in the world” is one example. But there’s something behind those labels and it’s called the heart. What’s inside the heart steers and drives us in life decisions. With it beating and pumping inside us, it’s easy to think we know what’s inside our own heart. But God alone knows the inner makings. Action Step: Pray and ask God to show you your heart, especially in tough parenting situations. He often unveils the roots of why we react and believe the way we do. Think of Hannah, offering her child for God’s service, Moses’ mom, setting him in a basket, or Mary, mother of a child at whom many cast stones and the spittle of their mouth. All showed evidence of caring, and you do too. Circumstances may or may not have helped wave the “good parent flag” over these ladies—at least not at the time. But if we look down history’s road, we see women with hearts turned toward God, mothers walking in faith, and women who appear to have tried their best at parenting. And so that’s what we do: we try our best, and our best comes with God. Action Step: Replace the words of condemnation or fear with truth-filled words of love. Gather three or four verses now in preparation for times when condemnation or fear hit. Darkness cares about us and our children. Why? Because of God. The devil seeks to devour any person who offers glory to God. From the time of Adam and Eve, darkness rears its head. And funny enough, those two are the parents of a son who murdered another of their sons. Did they question their parenting amid that turmoil? Maybe, but two things stands certain: none of us parent perfect and an enemy awaits to take advantage when he can. Action Step: Thank God for His grace and ask Him to protect you and your child from the evil one. In multiple Bible passages, God interacts with or spotlights parents. Consider Mary and Joseph, Elizabeth, Naomi, David, Noah, Adam and Eve, and more. God cares about parents just as He is concerned about their children. For God so loved the world (John 3:16) includes parents and children. He cares about you, son or daughter of God. He loves you, creation of His hand. Action Step: The next time you feel like a bad parent, thank God for loving you. Personalize John 3:16 (For God so loved ______...) and recite it. Pray it over your child as well. Jesus came to earth to forgive our sins—even those made by parents. We’re wise to set pride aside and ask for forgiveness when our anger boils over, we offer short answers, or hold resentment against a child. And then, if necessary, ask our kids to accept our apology. Forgiveness is a powerful tool linked with love. Action Step: Ask God to convict you of sin in parenting situations. Where necessary, ask Him to forgive you. Also, offer an apology to your child when one stands due. Struggles bring frustration and a variety of emotions, but they also offer opportunity to lean on God. May parenting be our reminder of our intense need for the love, grace, and forgiveness of Jesus. Action Step: Thank the Lord for His faithfulness and love. Thank Him that His perfect love casts out all fear. Ask God to show you opportunity to trust Him and believe His truth. May you and I be strong in the Lord, and in the strength of his might as we parent today, tomorrow, and beyond. Be encouraged, friend, as you sow seeds of faith in your children that will bear fruit in due time.